I am going to write generally today because whether my school has LAC pupils is a matter for me and them. But I would like to draw your attention to the DFE guidance on Promoting the Education of LAC Children, produced in Feb 2018. It is an odd world we live in, where OFSTED look at schools and judge them on their curriculums before they have actually had their draft schedule confirmed, yet we have guidance that is statutory that Leicester don’t seem to think is worthwhile following! In other words, my school can be condemned by the caprice of an inspector, whereas a child who may be in my care, who is one of the most vulnerable members of our society, isn’t protected by guidance which is actually statutory. I will give you some examples, if a looked after child is in your school, in Leicester, the LA should be acting like a good parent, not a good enough parent, not an okay parent, but a good parent. This is the law. The LA, not the school, should be the educational advocate for the child. This again is the law. Why then, is it that in my experience a LAC is depressingly unlikely to ever meet their education advocate in the school? As a good parent, surely they would be in the school, once a month, wanting to know about the LACs wellbeing, academic successes, attendance etc. In my experience, this example of a good parent is more like a hard to reach parent! Furthermore, why is it, that LAC are given a budget of £2500 (Leicester) when the document states that the virtual school head has considerable flexibility in the use of the funding to maximise the impact for individual LAC pupils? This isn’t a wish list, it isn’t something dreamt up in the offices at Medway, for the perfect system. It is in a statutory document that seemingly isn’t being adhered to. I have an example, a school put in a 1-1 support bid for a LAC, and this was turned down, because the school was catering for the needs of the child from its own budget. Unfortunately, Staffordshire Virtual School missed this ‘rule’, as in the guidance it gives the example of good practice for using the PP+ funding was support using a 1-1 TA. It beggars belief that the government’s guidance is being virtually ignored. We have all read the statistics for LAC and I thought there had been a change towards the attitude of these vulnerable pupils. It seems I was wrong. Whilst having a conversation regarding our curriculum and how best it is to implement a new curriculum, I was thinking about the systems set up in most schools for CPD. In most schools, there is a series of one off insets which are delivered to staff and not with them. I think this makes it very hard to introduce something such as curriculum change that addresses so many facets of school life, without a change in how schools deliver CPD. The elements that I think are missing are, the emphasis on the word continuous and the voice of the teacher. Our school has developed Oracy through collaboration. Our CPD involves small groups of teaches sharing professional dialogue around issues in the classroom. Our curriculum has been developed, modified and changed over a 7 year period with leadership from teachers and guidance from SLT. Good outcomes in KS2 and in term of Oracy outstanding. I have often thought, how on earth did education end up, with people who have no idea about education, being in positions to influence my school. Now by this, I don’t mean governing bodies who serve the purpose of offering checks and balances, but generally, other head teachers. As a consequence of data being absurdly high in their school, they gain an elevated sense of their own worth, but what has happened to education to give these people such a voice. I believe the answer lies somewhere in the life of Silas Marner. This man as you are well aware, was a famous miser and George Eliot hypothesised that his miserliness was as a result of a trauma that had left him without love or faith. Silas Marner, in the absence of love, decided to make money his motivation. George Eliot contrasted this with people who had sought solace, in grim times, by becoming more educated or more cultured. This lesson tells me that everyone has a choice and in an education culture, where there is an absence of a guiding faith, these head teachers had a choice, to follow the easy ‘glory’ of SATs results or to become a better human being. As a result leading a different and better school. To add to this, Medway’s results are very high but that isn’t why I do my job. I am currently talking to teachers about modelling and it struck me how little shared work actually uses role modelling from the perspective of a child who’s in the classroom. For instance, when studying teachers often hearing comments like, “oh what sort of word would sound nice here” or, this is a place where I could use a full stop. Much deeper learning would happen I think if the internal but verbal monologue focussed on where the child was in their learning. An example would be, I can put a fronted adverbial here because it adds interest, or I think the sky is blue looking but what colour is it precisely and what can I use as a simile. Added to this would be the specifity of the vocabulary and using the iPad or other access to the internet. We’ve also introduced a starter session in English in year 3 and 5 where the children look at works of great art and for ten minutes daily, five times a week, try to describe the work of art in detail. This has led to brilliant descriptions of Van Gogh, some Pre Raphaelites and a Caravaggio. It also has the intended consequence of introducing great works of art to the children. Involving children transparently to sharing their thinking methods to other children can only be of benefit: I need to only look back at my own schooling to think how I would have benefited from Graham Turnock or Kathryn Smith sharing how they approached a task, what prior learning they were going to explore, how they were going to choose the mot juste and how they were going to hit the success criteria in an interesting fashion. It starts with the teacher really engaging with what a high performing learner in their year exhibits and making the thought process to approaching work both coherent and clear. I think investing a school’s time in surfacing thinking is a much more helpful and supportive idea than growth mind-set, which emphasises hard work but without the attendant emphasis on what the child should be working hard at. Not everything that counts, can be counted. I’ve read a book called the tyranny of metrics which ploughs a well-worn furrow about the quaint ridiculousness of data. I read these ideas first in a book about how the public services were to be run more like businesses, with targets and performance management and came to be run like Stalinist Russia. Hayek has said, in his seminal book, the road to serfdom, that the public sector needs more agility to be able to respond to the market, a tract which was beloved by Keith Joseph and Margaret Thatcher. Hardly then a tome you’d use to countermand public service accountability systems. Hayek though said that this hard data led to corruption and laziness. Sir Keith Joseph used this tome to describe nationalised British Industry. Corruption is a difficult word but, of all the people who were interviewed after Enron, after the catastrophic collapse of banking, corruption starts with little things. Little things, I presume, like schools in the inner city having children attaining national standards in their GLD, little things like children at year 2 being much beyond their national peers. These schools are lauded as innovators and beacons. I’ve noticed they always explain these results with a little snake oil-a great deputy, a little bit of extra phonics, a soupçon of targeted data and yet, and yet……. What happens when these miracle workers export their fabulous, innovative school medicine? The other schools still languish at bottom of league tables baffled why they haven’t had the same results as their exalted peer whose data in phonics would make Eton blush. For all the talk of super schools or super heads, one normally finds one school performing much better. As an aside to my discursive blog last week I was gratified to be emailed from Sheffield of all places to explain what other metrics schools could use. I have ideas but my simplest one was to use the tyranny of this system to improve child protection in schools. How many referrals lead to children in need, how many child protection conferences do you attend, how many of your children have a plan? This would lead to more children being looked at, cared for, supported and protected but, of course, this would invoke the law of unintended consequences, viz that the social services would become more stretched and there may then lead to quantifiable evidence that some children don’t safeguard their children as well as others leading to a clamouring of witch hunting by unscrupulous school leaders selling their miracle cure to have more children safe……oh wait; not such a bad idea. Any other ideas are welcome and the light can shine in the dark places rather than the low hanging fruit of year 1 phonics. For as long as I can remember Music has always been a challenge in primary schools. Music specialists are sought after and musical instruments are difficult to maintain. Medway is no different in finding music a challenge, however, I may have hit on a solution. Whilst watching the brilliant BBC 4 programme, ‘Tones, Drones and Arpeggios’ I think Medway can use the magic of minimalism. How I understand minimalism, and I am far from a novice, leave alone an expert, is that minimalism is non-linear and takes space in vertical blocks rather than horizontal. In short this would mean instead of a symphony segueing from one block of sound to another, it would instead use the repetition of notes to produce the composition. I was introduced on Saturday to Terry Riley’s G Song. If you want a full explanation of its genius, I suggest you watch the programme, nevertheless it seemed to me there is a link between teaching simple composition, the use of time, choral singing, appreciating great music and playing instruments, which I believe can all be attained over a scheme of work in KS2. What makes Terry Riley’s work so incredible is that the musician is left to dictate the pace of music, which in essence creates a different piece of music each time the music is played. Its genius for adapting to primary schools is that children could read and play simple notation and as long as they can keep time, they could produce original, worthwhile and transcendental pieces of music. As a school we are going to trial this. I will let you know how we get on. At the moment GDPR is causing tremendous amounts of confusion and concern. I have read the information on the ICO website, and have sought expert advice. My lack of clarity was around why I was getting advice for a DPO, when as a data controller, I have the control. If there is a data protection breach, that would be up to me as the headteacher to investigate, as is the case with every LA. If there is a conflict of interest in data protection in an investigation, why are the same rules not applied here as they are when I have to investigate financial irregularities or disciplinary actions? If the issue is an allegation against me as the data controller, then we already have a system in place for accountability-the governing body! I have been made aware that if the DPO is being sold to us through a private contractor, then if the advice is wrong, the situation becomes worrisome as I will have to end up suing them for poor advice. We seem to have lost the reason why we are doing this. I have had conversation around informed consent. I have even had a conversation around translation into different languages and informed consent. The LA process- countless council tax returns, will they have informed consent? Your tax returns- will they have informed consent? Can you say I don't want my details kept? Data protection in schools is a matter of common sense. A retention schedule is already in place for staff and pupil records. We need to slightly adapt our processes; put data protection into the minds of our staff and to make sure our fair processes notice is easily understood and obtainable. But the thought of the ICO fining my school for not having a DPO, whilst not fining LAs for serious breaches of data protection, seems both unbelievable and wrong. When people talk about huge fines on data breaches, I can only refer you to how many fines have been issued to Leicester and Leicestershire local authorities for Data Protection breaches. Currently it stands at 0. My school will work as hard as it is capable to ensure the data, as always, is processed fairly and hopefully in adherence to all the regulations. The way I see it, this little school will be insignificant in the wider scheme of things, when people are finding out that data is being used to racially profile them, using sophisticated algorithms which puts car insurance up if you are from a certain ethnic background. Recently I have read a great deal on Art Education. I have been trying to get to the bottom of how art should be taught in schools and I've been hit with the idea that there is no easy solution to the teaching of art. I have looked high and low for the Singapore Arts Curriculum, or KTC to painting, but people don't seem to be invested in making money out of arts education. Is it because we have come so far from our traditional values in primary education that we no longer teach art or is it that the knowledge economy doesn't value artistic and creative people? When I hear a primary school headteacher telling me that primary education is to prepare children for tests, I can but shake my head and wonder. I used to think that being a headteacher was being the brightest and the best, but I fear that some heads think they are a middle manager of a company that produces literate and mathematically functioning individuals, prepared for the life in the 21st century of testing. This is what I have found about arts education. Firstly, it isn't straight forward, the beliefs I have, and assumptions were challenged and after consideration some of my ideas were wrong. I think as a school, you have to commit to a 'theory of art'. Technocratic Art (South Kensington Approach) where art is taught through a series of skills which value manual dexterity and coordination and is taught through a disciplined and reproductive style. Child Art Movement (sometimes named after Franz Cizek) which saw art as a natural development governed by a child's physical and psychological growth and had at its core, unbridled expression. Aligned to this but not the same is Art as an Expression, if you will, a release of the subconscious, which valued freedom to conquer a complex world; putting the individual in a unique therapeutic place. Then we move to the 80s where the economic rationalists began to takeover art and the teaching of art and art was seen as something which was to be observed, planned, created, developed, reflected upon and evaluated. Arts as an Aesthetic response. Embedded in this idea is that culture and civilisation are transmitted from generation to generation and to be civilised, in and of itself, is a sign of class. The knowledge of painters, styles and movements are visible emblems where someone can show to the outside world their background. As a consequence the teaching of art could be used to narrow the gap with class differences. The next question would be which culture is one trying to transmit-a Bangladeshi middle class one or a Pakistani working class one? A white British middle class one or a euro centric working class one? Arts as Symbols and Mediator of Social Change is where a manifesto could be used in forward thinking schools, to use the art curriculum to embed democratic values, to challenge crass thinking and to unify all the previous ideas. Post modernism which is how is life lived and reflected upon by great minds with the proliferation of images, expanding horizons, the shrinking of the world, multiple differences in the idea of culture, relativism, more cognisance of the privilege of the art world, computerisation, hyper reality and ideas about what culture actually is when we can enhance images, falsify news, define beauty in an individual's terms, and in terms of Facebook, Instagram, snapchat. We have become authors in our own play as we become increasingly atomised, do we define our own culture, are we lived pieces of art? My conclusions are like with any good piece of research are unclear, I have more questions than answers, as a consequence, i will follow and put this information to our intellectually able for them to decipher what it means to teach art at Medway Primary. When reading 'Don't send him in tomorrow', I came across a quote from Hubert Humphrey, former Vice President of America, 'It was once said that the moral test of government is how that government treats those who are in the dawn of life, the children; those who are in the twilight of life, the elderly; and those who are in the shadows of life, the sick, the needy and the handicapped'. We have an expression in our school that coincides with ' The shadows of Life', which is shining a light in to the darkness, it is an expression I used when setting up our Community, Family and welfare Team. This hard working team of 4 people sometimes work with the disadvantaged or the dispossessed or the disenfranchised. They sometimes work with the lost, the last or the least. They also work with the looked after or the looked over and sometimes with all of these at once. What I do know is that this light is a bright beaming beacon, supporting children to attain good outcomes. Since its beginning it has helped 30 families to navigate the sometimes choppy waters that life brings. This great bunch of people inspire me daily and give a moral purpose to all Medway's work. When I was a young man, making my way in my career, I used to have to listen in staff meetings to relevant 'clap trap' from senior members of staff. This CPD was unasked for and to my mind gave an insight into how poor these senior leaders must have been at teaching. When I became a senior leader myself, I decided to ask people what they wanted. Most people don't have a fear of freedom, most people want to be treated as active participants in managing a school, so most people agreed that the way forward was to divest more power to teachers to make decisions and in a clumsy phrase, re-professionalise them. Teachers at Medway are responsible for their own planning. No scheme. No Singapore Maths. No KTC. That isn't to say that we don't follow some schemes that need a robust and systematic approach such as phonics acquisition. Teachers decide their own CPD in small groups. At one time, in our school, there can be as many as 6 CPD meetings happening. Teachers are given time to read and follow a masters programme, if they choose, which is paid for by the school. NQTs can lead sessions where they have an expertise. The marking policy is decided in phases. Scrutinies of work are done by teachers themselves and phase leaders manage their teams data. What then you may ask, do I do? In short I lead. Medway has an innovative curriculum, interesting projects, exciting initiatives and well rounded personnel. These things didn't happen by accident. My job is to ensure barriers to success are removed, that we don't follow the wrong pathway and get lost and that people are developed to become self-evaluative practitioners. I am not arrogant enough to suggest my ways are better than others, but unlike others, I am willing to adapt and change my style. Rather than leading from the front, it's about leadership of everyone. Bullying takes so many forms and whereas I agree with the argument for it being persistent, harmful words, casually tossed, cause a great deal of anxiety to our young. I found it odd whilst reading the other day, that someone had killed somebody for being a snitch. The victim who had told the authorities, was reporting on a terrible crime and yet the language of acceptance seems to provide a framework that calling someone a grass or snitch ensures the perpetrator has some justification for their violent conduct. Everywhere bullies hide. Every shadow, the bully does their work. We must be vigilant and shine light into the darkness. We must encourage our children to tell, whether they are being bullied or whether they are a bystander. We should celebrate it. How does it become so important in a child's life that somebody could bully them and silence them by commentating that they are a 'snitch' or a 'grass'? At our school, we are de-valuing the words and placing the importance on telling when someone is doing something nasty to you or others. We have posters around the school with slogans such as 'snitch for the greater good' and ''grassing is good, if it helps those in need'. If you look on our twitter page and our gallery, you will see our 'Friendly Faces' (Anti-Bullying Squad) being supported by Geronimo Stilton during Anti-Bullying Week. 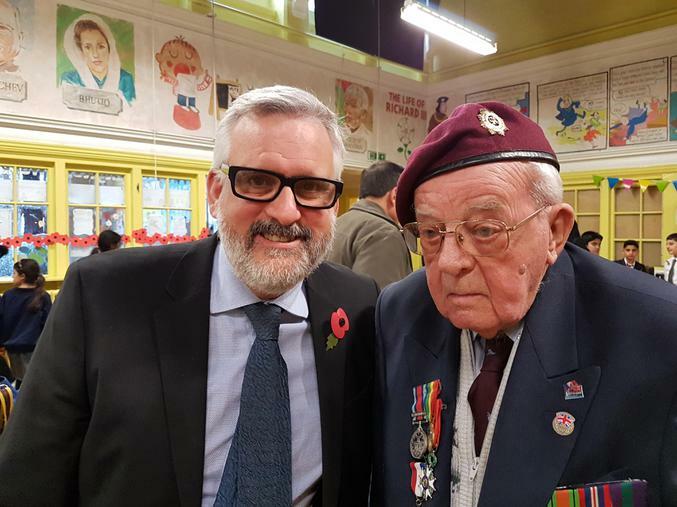 It was an honour to meet a real life hero on Friday, Ted Bootle. At the assembly our pupils spoke a great deal about fighting for freedom. A phrase that needs unpicking. I wear my poppy with pride because I think it exhibits a great deal about our country. A country that fought for freedom, not knowing where that freedom ends. A country at the time that didn't have an equalities act, that didn't have a great deal of immigration and a country that was separated from Europe. But those honourable people, like Ted, sacrificed their young adulthoods to protect that idea. So when I gaze around our school, and identify the values our children exhibit, I know that when I wear my poppy, those brave people did not sacrifice in vain. As a staff, we have been suspicious of Growth Mindset as some of us remember headteachers of the past: extolling the virtues of brain gym; left brain thinking; VAK; VCOP; The 5 Rs ; multiple intelligences and drinking water in a specific way! Therefore any 'fad' receives short shrift at Medway. Growth Mindset is a brilliant insight with strong evidence that some people believe in a fixed IQ. That is Carol Dweck's view point, and I agree. What I don't agree is that if teachers say to children, 'You haven't achieved this yet', this is a natural progression from Carol Dweck's position. Carol Dweck does not comment on attitudes to learning. Our schools position is that achievement begats motivation, therefore if a teacher spends time planning a lesson which is involving and engaging, modelled and scaffolded, assessed keenly and fed back purposefully, then the achievement the child experiences will encourage that child to produce better work. Instead of assemblies about how children can achieve if they try just a little bit harder, more assemblies should be about what they have achieved and what they can do next. Our school has started a conversation regarding marking and workload. We have come from the point that feedback should move learning forward and importantly mean more work for the recipient of the feedback than the donor. What has moved my learning forward is how we motivate children to want feedback. If we believe some children have the opinion that their IQ is fixed, comments regarding their feedback will not be well received. How do we build with our children a culture where they embrace continual improvement? One way is simply to state, I as a teacher have high standards and I know you can match them. It is important to note here that Carol Dweck's work on Growth Mindset, only pertains to IQ not to attitude. Children who are in our school are definitely, easily convinced that the more effort they produce, the better their outcome, which is why Growth Mindset doesn't appear in our curriculum. This doesn't mean we disregard Carol Dweck's Growth Mindset, it just doesn't seem that relevant. To return to marking, we are trialling different ways of assessing. One cohort is marking in a detailed fashion (25%), 25% is skim marked, 25% is peer assessed and 25% is self-assessed with the teacher overseeing the judgement. In other classes, whole class feedback is given when the teacher identifies the errors or misconceptions that commonly appear. Some classes mark by evaluating 3 pieces of good work and then critically assessing them. After these have been trialled, Sarah Hill (an outstanding year 6 teacher) will draw up a marking policy which works for the teachers and the learners.